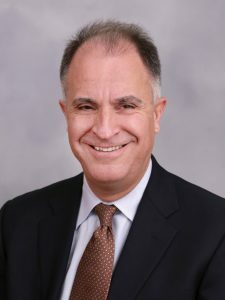 David Yermack is the Albert Fingerhut Professor of Finance and Business Transformation and Chairman of the Finance Department at New York University’s Stern School of Business, where he has been a member of the faculty since 1994. He is also an Adjunct Professor of Law at the NYU School of Law, Director of the NYU Pollack Center for Law and Business, and a Research Associate of the NBER Law and Economics program. In 2014 Prof. Yermack began teaching a full semester course at NYU on Digital Currency and Blockchains with his Law School colleague Prof. Geoffrey Miller. The course was the first in the world on this topic taught at a major research university, and it now draws more than 200 students annually. NYU Stern launched a FinTech MBA specialization in 2016. and this program will offer more than 12 FinTech courses in an interdisciplinary joint venture between its Finance and Information Systems departments this year. In addition to his recent research on blockchains and digital currencies, Professor Yermack has published some of the most cited papers in the fields of executive compensation and corporate governance. He has also written papers on such diverse topics as options in baseball player contracts, incentive compensation for clergymen, tobacco litigation, fraudulent charitable contributions, CEOs’ mansions, and the fashion industry. Professor Yermack was awarded AB (1995), MBA (1991), JD (1991), AM (1993) and PhD (1994) degrees, all from Harvard University. He has been appointed as a visiting professor at 12 international universities, a visiting scholar at the Federal Reserve Banks of New York and Philadelphia, and has given invited research seminars at more than 100 universities and institutes worldwide.